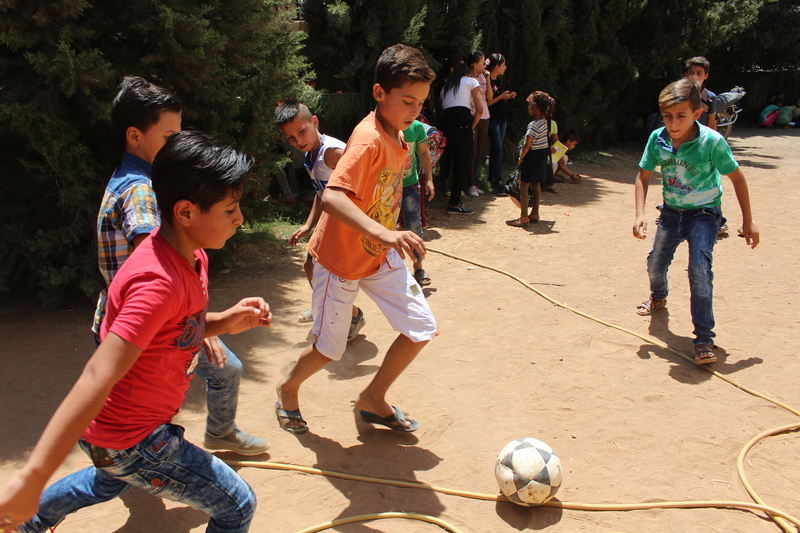 Mohammad and Sami play football with their friends during recess at the UNICEF-supported community learning centre offering self-learning to out-of-school children. Qamishly, Syrian Arab Republic, 10 September, 2017- For the two siblings Mohammad, 10, and Sami, 8, life was good. Like most children in the world, they went to school, played with their friends, watched cartoons, and gave their parents a hard time to do their daily chores. That was until almost four years ago, when Raqqa fell under extremist rule, causing children and their families to endure immense suffering. To make things worse for the family, fighting and attacks near their home in rural Raqqa in north-eastern Syria escalated two months ago, forcing them out of their school and their home. “We left everything behind, except for the clothes on our backs,” says Mohammad, recalling the tiring trip. “We left our home in Maysaloon farm in the middle of the night and walked to another farm where we stayed without food or water for one full day,” he continues, as he fidgets with a notebook. Mohammad and his family then borrowed a car to drive to the city of Qamishly. “The worst part of the trip was the fear,” says Mohammad. “The fear of being trapped in the middle of the fighting and getting killed,” he adds. Just like the two siblings, the children of Raqqa have witnessed immense suffering over the past four years. Insecurity and access restrictions have severely limited the delivery of humanitarian assistance to the area. The last United Nations inter-agency aid convoy to reach Raqqa was in October 2013. Restrictions were also imposed on services, including health and education. This has left children and their families deprived of the most basic services, and forced to pay soaring prices for commodities. But of all the adversity the people of Raqqa have lived through, the constant fear had the most impact on children. “We used to run to the corners of the house whenever we heard fighting,” says Sami. “We learned to stay away from windows; one day a shell hit our next door neighbour’s home, and one of our windows shattered into pieces over my head while I was playing,” he adds, recounting the trauma he has witnessed at a very young age. Mohammad (in orange) and Sami during their math session at the UNICEF-supported community learning centre offering self-learning to out-of-school children. When the two boys arrived in the city of Qamishly, they had not seen the inside of a classroom in almost four years. They both enrolled in the UNICEF-supported self-learning programme. The unique curriculum is especially designed for children who are out of school, enabling them to study at home, in places of worship or at community learning centres with the help of an adult; whether caregivers, or community volunteers and / or family members. UNICEF supports 110 community learning centres in Qamishly and Tal Hamis districts, reaching over 2,500 out-of-school children with this innovative alternative learning programme. Mohammad and Sami are excited to be back in school. Mohammad hopes to be a businessman when he grows up while Sami wants to follow his father’s footsteps and become a carpenter. Despite their dark memories of Raqqa, the siblings still long for their ‘home’. “We miss our toys and our friends but most of all, going fishing with our father on the Euphrates River!” says both Mohammad and Sami.